Roasted Cauliflower is one of the best side dishes, because it’s healthy, simple, and versatile. 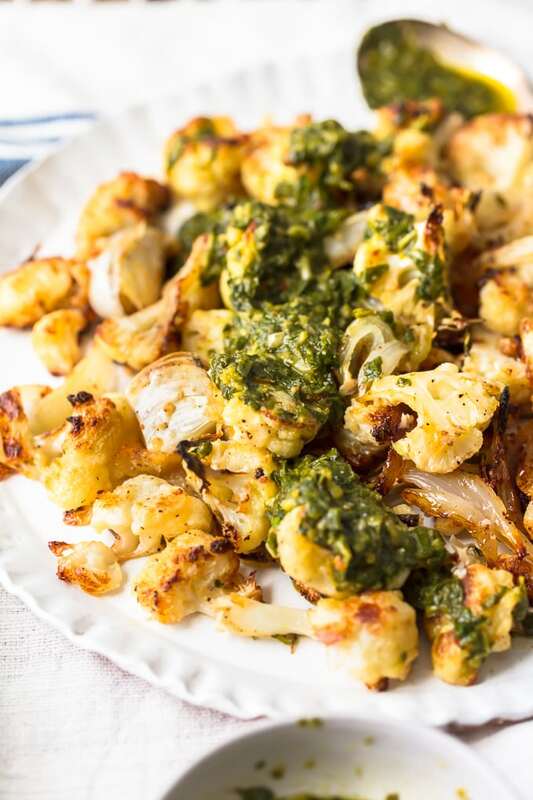 This oven roasted cauliflower recipe with homemade Chimichurri sauce is one of my new favorite ways to eat my veggies! You get the crispy garlic cauliflower covered in amazing chimichurri. One of the best cauliflower side dishes to pair with a steak, chicken, or pork. 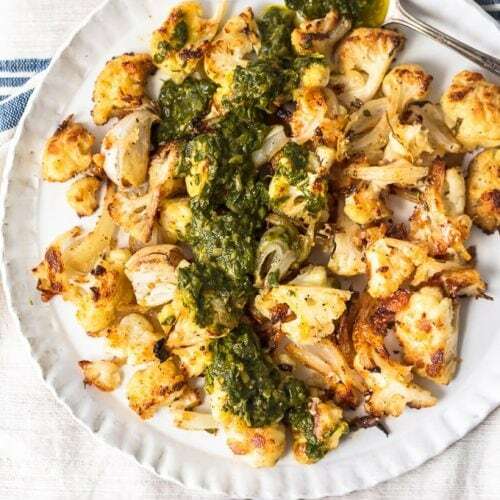 Roasted Cauliflower is the best side dish, and this garlic cauliflower with chimichurri sauce is absolutely perfect with steak or chicken. 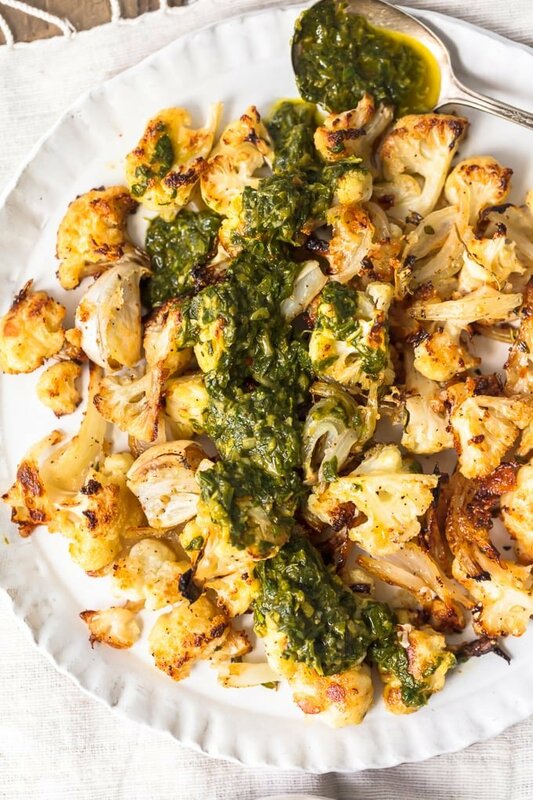 This roasted cauliflower recipe with chimichurri sauce is a new favorite! I’m always looking for more vegetable side dish recipes to pair with my favorite meat dishes so I have something healthy AND flavorful to complete the meal. Oven roasted cauliflower is definitely one of the simplest yet most versatile dishes. You can add in any flavors, spices, or herbs to create something new and tasty. I cooked it with plenty of garlic, onion, and thyme to get the best flavor, and then topped it with my homemade chimichurri recipe to make it EVEN BETTER. I love serving this healthy cauliflower side dish with steak or grilled chicken! 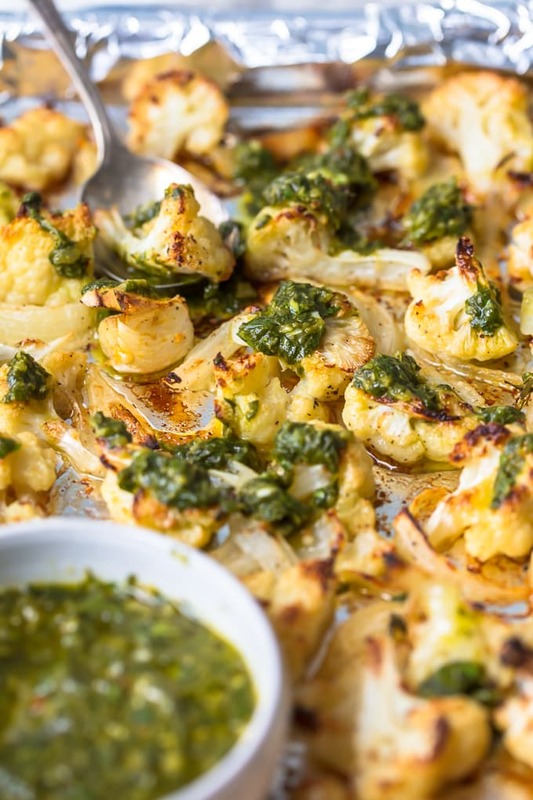 Roasted Cauliflower with Chimichurri Sauce is a simple, healthy, and delicious side dish. Serve it with steak, chicken, or any meal you like! Oven roasted Cauliflower is really easy to make. It’s one of those simple side dishes you can just throw in the oven while you’re focusing on cooking your main dish. Let it get crispy and flavorful without worrying too much about it, and then it’s ready to go! I like to roast cauliflower with chunks of garlic, onion, and lots of herbs so it can soak up all the flavors. You can use different spices, herbs, and seasonings if you prefer, but this is the basic process for making roasted cauliflower to follow every time. It comes out nice and crispy and full of flavor. The homemade chimichurri sauce is my favorite part of this recipe! 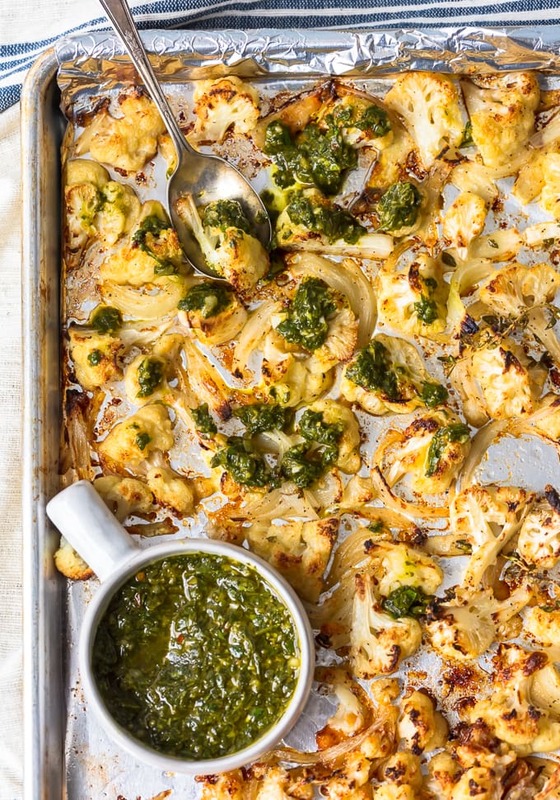 Roasted cauliflower is SO GOOD, and the chimichurri really brings it to the next level. I created my own chimichurri recipe based on the traditional Argentinian sauce. While it’s generally used on grilled meats as a marinade, I love the garlicy flavor so much that I wanted to use it on other stuff too! I think it is just perfect on this roasted cauliflower recipe and really makes an amazing cauliflower side dish. I’m always on the hunt for easy, healthy, and delicious side dishes to cook up for dinner. Once I have a great meat dish in mind, I need the perfect thing to pair with it. 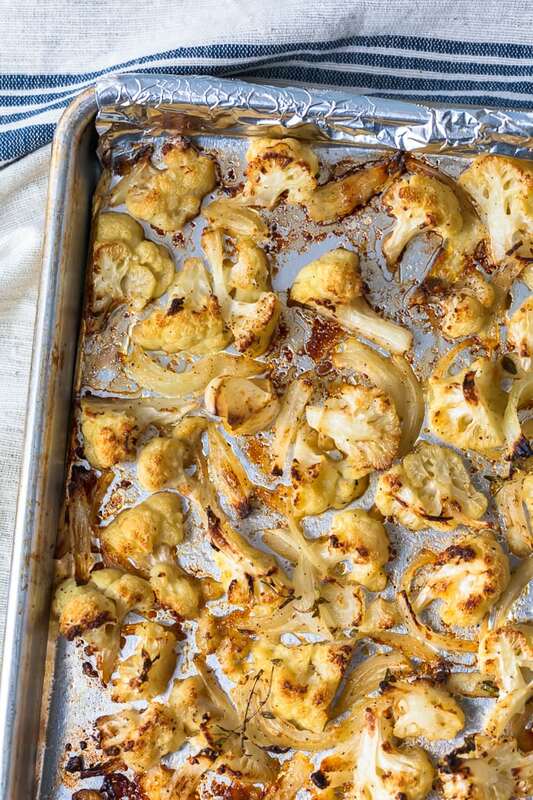 This amazing roasted cauliflower side dish recipe goes well with just about everything! I love crispy and flavorful it is, especially topped with the chimichurri verde. I’d love to pair this with a Chimichurri Steak so I can use the sauce on both dishes! But I also love it with salmon, brined chicken breast, pork tenderloin, chicken roll ups, or even as a healthy french fry replacement with a turkey burger. How long do you roast cauliflower at 425°? To get it nice and crispy, roast cauliflower at 425°F for about 35-45 minutes. Cauliflower is really great vegetable with lots of health benefits. It’s considered to be a “cancer-fighting” vegetable; it’s anti-inflammatory and rich in anti-oxidants; and it’s filled with tons of important nutrients like vitamin K, riboflavin, fiber, folate, potassium, and more. How long can you keep cauliflower in the refrigerator? A fresh head of cauliflower (uncooked) should usually last in the refrigerator for up to 2 weeks. It tends to hold up better than a lot of other produce. This roasted cauliflower recipe can be stored in the refrigerator after cooking if you have leftovers. Store the cauliflower and the sauce separately. The cauliflower should keep for up to 1 week, while the sauce can last for 2 or 3 weeks. I absolutely love this oven roasted cauliflower side dish recipe! It goes with everything, it’s easy to make, and it’s just so darn delicious slathered in that tasty chimichurri sauce. See the recipe card below for details on how to make this roasted cauliflower recipe. Enjoy! Roasted Cauliflower is one of the best side dishes, because it's healthy, simple, and versatile. 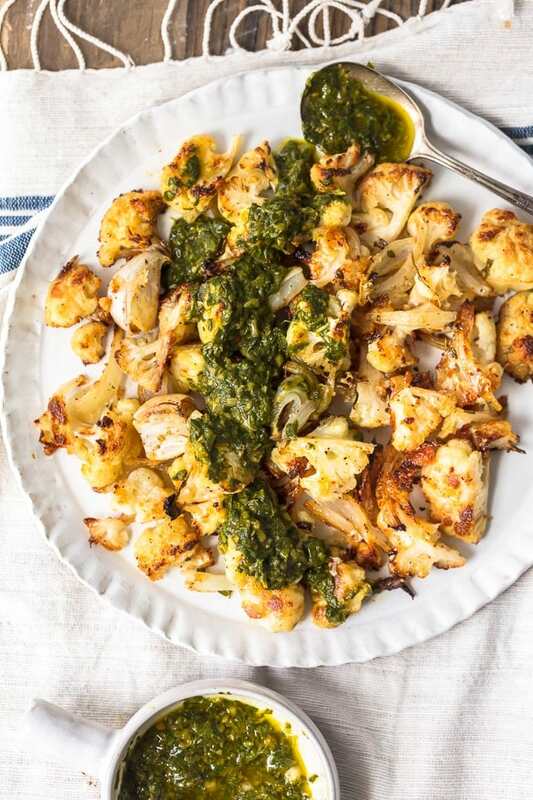 This oven roasted cauliflower recipe with homemade Chimichurri sauce is one of my new favorite ways to eat my veggies! You get the crispy garlic cauliflower covered in amazing chimichurri. One of the best cauliflower side dishes to pair with a steak, chicken, or pork. 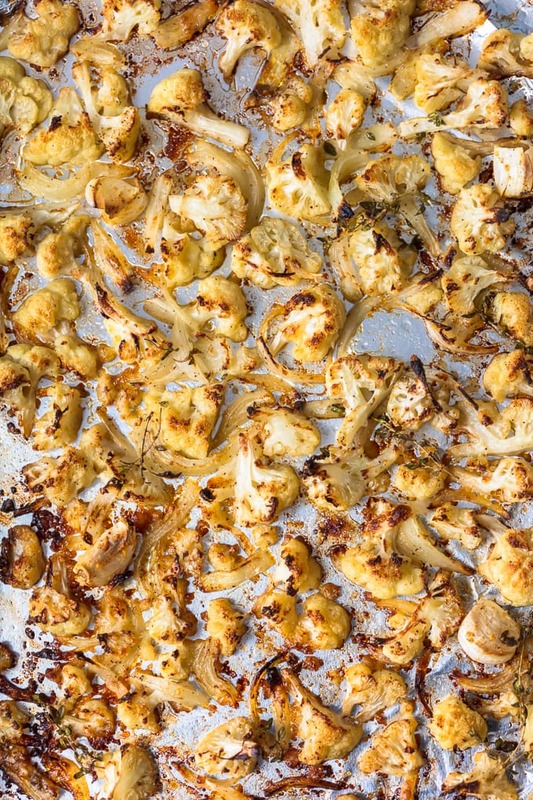 Make or set aside while cauliflower roasts. 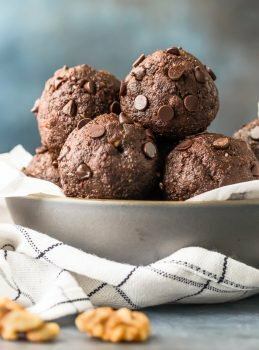 Click above for homemade recipe or purchase store-bought. Heat oven to 425°F and cover a rimmed baking sheet with foil. Lightly spray the foil with nonstick spray. Place the cauliflower on the prepared baking sheet and add the onion and garlic cloves. Drizzle with 3 tablespoons of olive oil and gently toss the cauliflower and aromatics to coat. Sprinkle with the thyme, red pepper, salt and black pepper and drizzle the remaining tablespoon of oil over all. 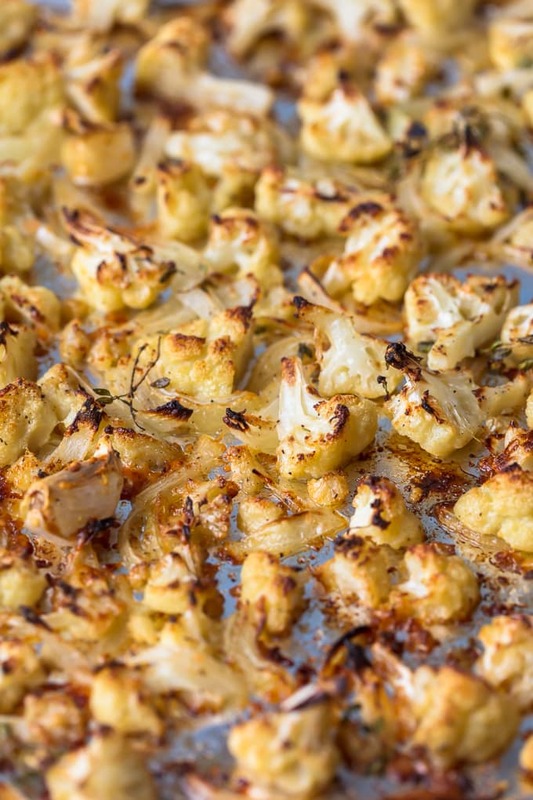 Roast all for 35-45 minutes or until the cauliflower is golden and tender. Let rest 5 minutes before plating. Drizzle the cauliflower with some Chimichurri Sauce and serve some on-the-side. 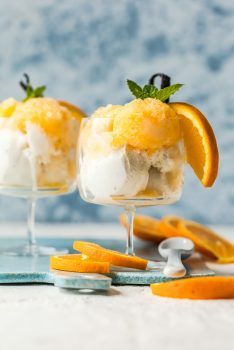 I am just so in love with this recipe! I just made a chimichurri sauce over the weekend, but I used it on short ribs. I never though to use it on roasted cauliflower. Awesome idea! I love that chimichurri goes on so many things!!! I haven’t tried it on short ribs but now I’m dying to!